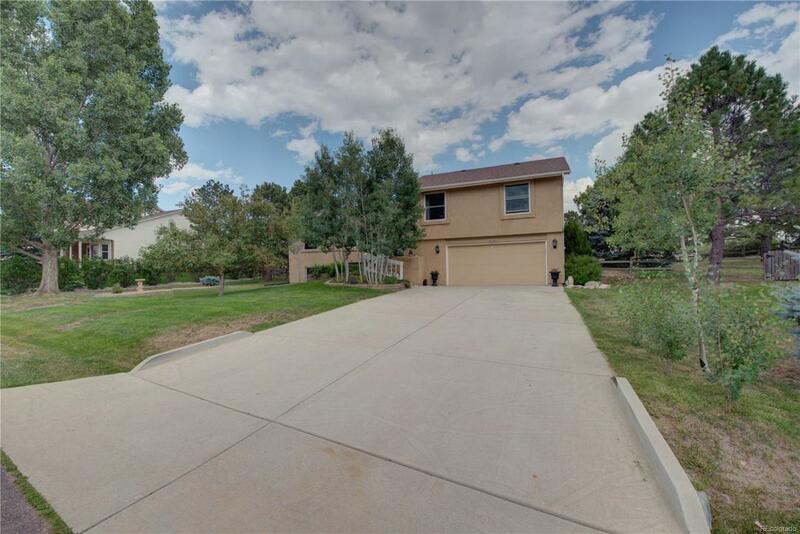 A rare find in Colorado Springs, this home features a large 0.29+ acre lot with lots of mature trees that backs to open space! Mountain views from your front door! Inside your main level features a large, walk-out living room space w/ wood burning fireplace that opens to the kitchen and formal dining room. Your kitchen features SS appliances, beautiful cherry cabinets, granite tile countertops, eat-in area and bay window that looks out to your open space backyard. On the upper level, find all 3 bedrooms, including a master w/ att bath that features a walk-in shower and dual sinks. As you walk downstairs, you'll notice a large laundry room on your lower level w/ cabinet space for additional storage. Across from the laundry room is access to the attached garage. The basement level features a large, open layout with a family room space, 3/4 bath, and room for an additional bedroom, office, hobby room, etc!